Motorola has started Android 5.0 Lollipop soak tests for Moto E and Moto Maxx. The Lollipop soak testing for Moto Maxx has began in Brazil and Mexico, and for Moto E in Brazil and India. With Soak Testing, the company starts by rolling out the upgrade to smaller test groups before releasing it widely, and if the results are strong, they continue the rollout to more phones. The soak test helps in monitoring performance data and user feedback over several days. On basis of soak test users feedback, the company tweaks software and incorporates new changes to fix any issues. 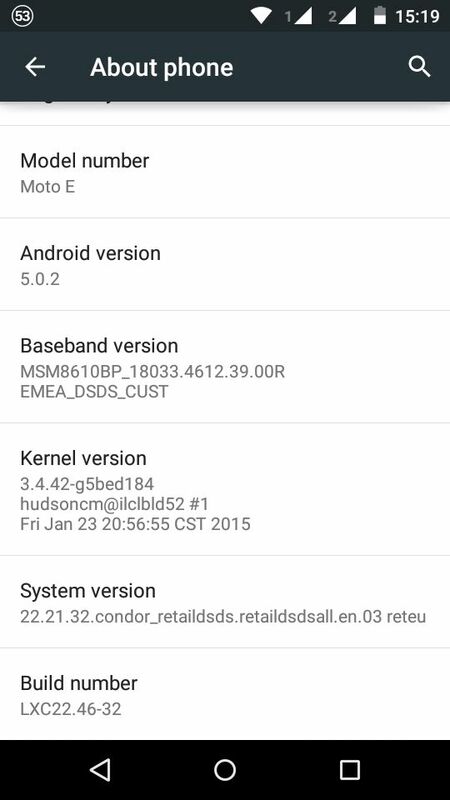 The Lollipop soak test for Moto E is now rolling out in India and some users have got it. In case you’re eager to try out the latest Android 5.0 upgrade, then you can get it by installing the Lollipop soak test OTA update manually on your Moto E.
Below procedure is tested on Indian Moto E running Android 4.4.4 (locked bootloader, unrooted, fully stock). This update doesn’t wipes your user data. Update might take a long time. It’s recommended to have 500 MB of free space on your internal storage. Initial boot takes time, so be patient. Disclaimer: We’re not sure if it works on other models too. Try it at your own risk. Note: This is a soak test update that might have some issues. Those concerned can rather wait for the final update. Before proceeding, make sure your phone is running stock Android 4.4.4 KitKat. 2. Place the download file “Blur_Version.21.12.40.condor_retaildsds.retaildsdsall.en.03.zip” in main directory of external SD card (might also work with internal storage). 3. Update both these system apps: Motorola Update Services and Motorola Contextual Services. 4. Now go to setting and ‘check for update’. Note: If you receive ‘Your software is up to date’ message then boot in stock recovery and wipe cache partition. Then power on your phone and check for updates. 5. When ‘New system software available’ message is shown, select ‘Yes, I’m in’ to proceed. 6. Once the above process is completed, you will get ‘Install now’ option. 7. Install the system update and then your phone will reboot. Stay patient while the phone boots for first time. Thanks Suraj Jain for the tip. I’ve updated the guide. Please try again and tell if that helps. i updated my moto e as your guide and its working fine with lollipop..
my doubt is will i able to get the official updates in future if theres any bug in the installed version ? Yes, you’ll get official OTA updates like before. Dear Mayur, Thanks a lot for your help in updating my Moto E with Android 5.0. Indeed I am very happy with the new version. I really thank you very much for your support in this regard. Dear Mayur, I just wanna ask that whether is this full version or something else? If not then when we will get the full version of Android 5.0? There is nothing like demo or full version in Android OS. This is a soak test version and it could be final build if they find it good enough. Ok…Once again thanks a lot from bottom of my heart!!!!!!!!!!!!!!!! Stay blessed!!!!!!!!!! Warranty won’t be void and you’ll get future updates too. Thank u bro for ur suggestions for my mobile to lollipop. Now is there any Chance of downgrading lollipop to KitKat…. Please clarify whether moto e mobile users will receive completed upgrade without following above upgradation procedure manually after soak test completion. Will it be upgraded automatically or not? It is OTA upgradation. Have you placed the file in main directory of external sd card. Yeah even I have done this but still same message also the file name you provided in download Link is different from the one you have mentioned here.Which one is correct ? Which one to use .? I request you to post a video of how to update moto e to lollipop to youtube and give me the link… I tried as guided by you, but failed. will i be able to restore kaitkat present version(4.4.4)after this update? Thnx for the article – really useful. 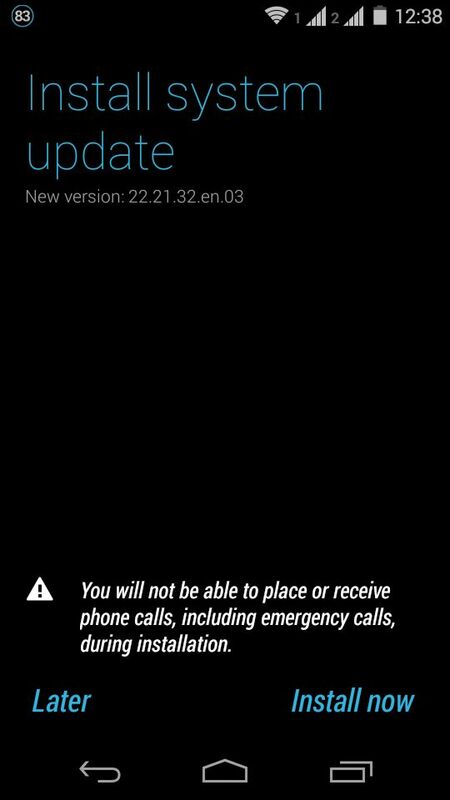 Thanks for tip, I am currently having cm11 on moto e does this method work on it ? Bro i had i updated successfully…nd working fine…but i has some bugs…will i get the official android 5.0.2 updates.. I have updated to lollipop but i wish to get the kitkat back can you tell me how do get 4.4.4 back after doing this? how root it back to kitkat because i am facing some colour bug in my mobile . i have doubt that will i get the final update if i install the update in this way?? 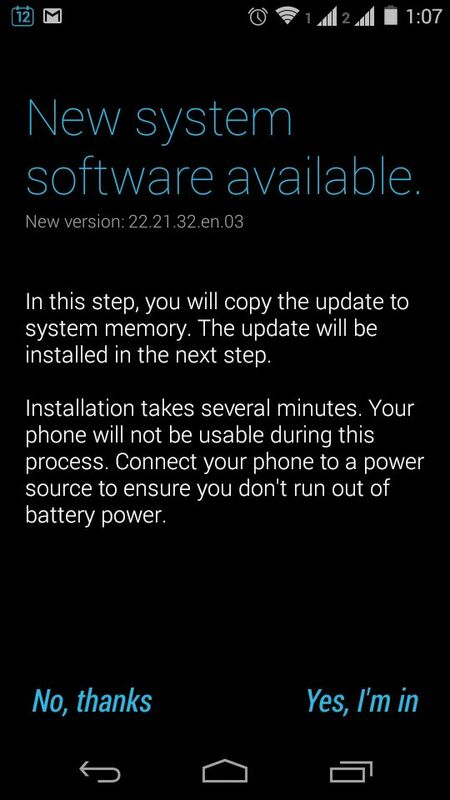 I follow your procedure for lollipop update…. But showing \”your device software is up to dated\”??? Please Tell what to do????? Yes you can, no need of that file after the update is done.